Exploring the liability of intermediaries; do they hold any responsibility for the actions of 3rd party users? 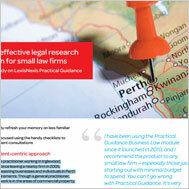 Written by Matt Lawrence, Strategic Product Manager Legal, LexisNexis Pacific. 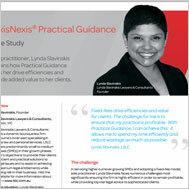 Sole practitioner, Lynda Slavinskis explains how Practical Guidance helps her drive efficiencies and provide added value to her clients. As a result of the many changes and ever evolving nature of her specialist area, Sarah Sealy used Practical Guidance to ensure that she could efficiently address all matters with ease and confidence. Susanna Ho is a sole practitioner working in Inglewood, Western Australia. Since leaving a nearby firm in 2005, Susanna has been assisting businesses and individuals in Perth with their legal requirements. Winners & Losers — What is the future for corporate insolvency in Australia? In recent times, the collapse of such companies as HIH have emphasised the destructive impact of corporate insolvency, not only on companies as a whole but also on their employees, hare holders, creditors and tax payers. Tim Somerville explores these impacts and the role of liquidators, as part of the government's responses to the problems. LexisNexis® combined two business intelligence solutions to meet M&C Saatchi's information needs, Nexis® and Company Dossier. BonuraLegal is a boutique legal practice specialising in compensation claims and general litigation. The practice services clientele not only in the local community but also in wider Sydney, regional areas and interstate. The London Borough of Lambeth (Lambeth Council) is one of 14 local authorities that make up Inner London. It is one of the most densely populated inner London boroughs, with a diverse population of around 300,000. 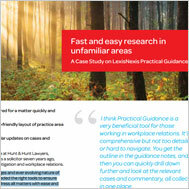 LexisNexis Client Advisor helps Warwickshire Legal Services to maximise value from LexisNexis Visualfiles. 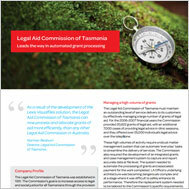 The Legal Aid Commission of Tasmania must maintain an outstanding level of service delivery to its customers by effectively managing a large number of grants of legal aid.